On April 24 the battle for the Seven Kingdoms begins again as Game of Thrones returns to HBO. The much anticipated season premiere is sure to bring danger, double-crossing and dragons. If you’re hosting a Game of Thrones party, offer your guests these small bites of sweets to nibble on while viewing. These cheesecake truffles resemble a sparkling dragon egg but are filled with creamy, ginger and raspberry flavors. An elegant treat worthy of the Mother of Dragons. In a bowl stir together the cream cheese, gingersnap crumbs, powdered sugar and salt. Gently fold in the raspberry jam and place the mixture in an airtight container in the refrigerator for 2-3 hours until firm. With a #30 disher scoop the cream mixer and form into a slight egg shape. Place on parchment or a silpat. 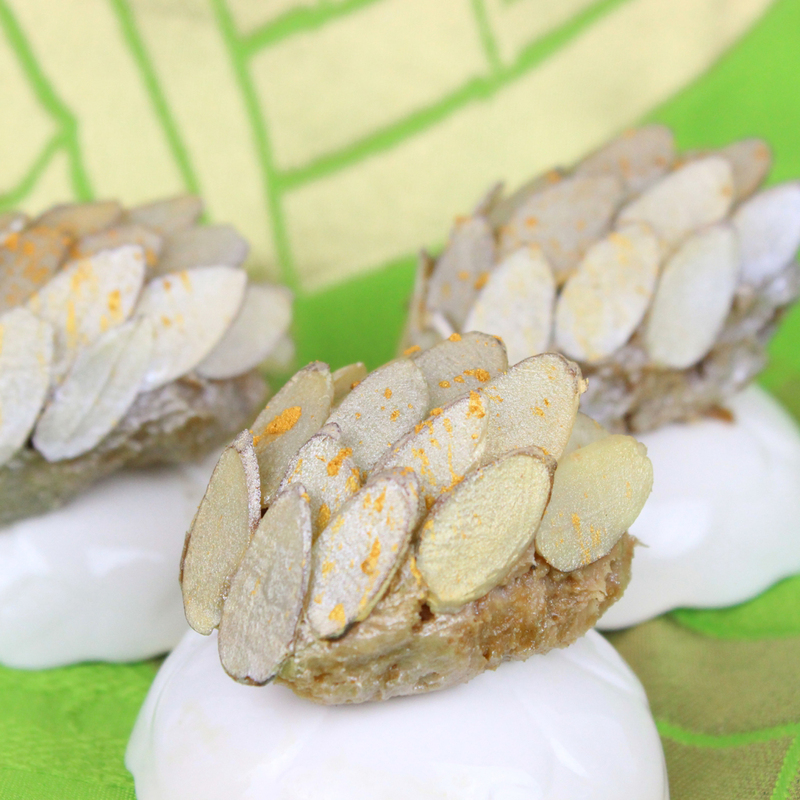 Overlay the sliced almonds to form a pattern on the top half of the egg. Once the almonds are in place, spray with edible Silver Mist, then edible Gold Mist. Add flecks of gold luster dust over the eggs. Once the mist has dried the dragon eggs are ready to serve. Jenn Fujikawa is a lifestyle and food writer. Follow her Twitter @justjenn and Instagram@justjennrecipes for recipes, DIYs and lots and lots of Star Wars treats.